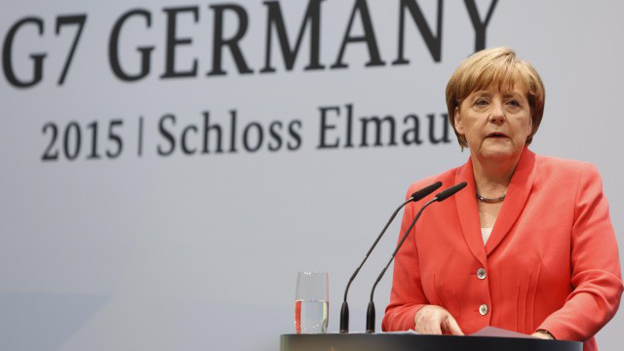 As host of the summit, which took place in the foothills of Germany’s largest mountain, the Zugspitze, Merkel said the leading industrialised countries were committed to raising $100bn (£65bn) in annual climate financing by 2020 from public and private sources. 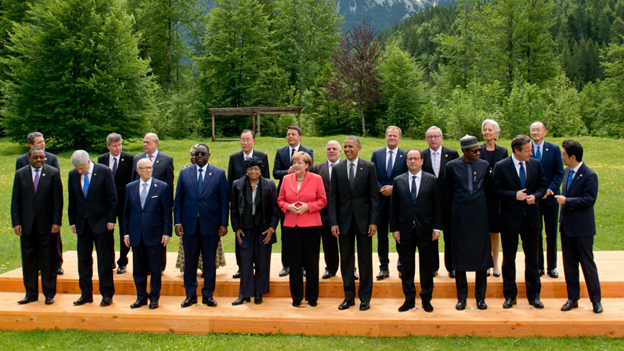 In a 17-page communique issued after the summit at Schloss Elmau under the slogan “Think Ahead, Act Together”, the G7 leaders agreed to back the recommendations of the IPCC, the United Nations’ climate change panel, to reduce global greenhouse gas emissions at the upper end of a range of 40% to 70% by 2050, using 2010 as the baseline. Merkel also announced that G7 governments had signed up to initiatives to work for an end to extreme poverty and hunger, reducing by 2030 the number of people living in hunger and malnutrition by 500 million, as well as improving the global response to epidemics in the light of the Ebola crisis. Poverty campaigners reacted with cautious optimism to the news. The participant countries – Germany, Britain, France, the US, Canada, Japan and Italy – would work on initiatives to combat disease and help countries around the world react to epidemics, including a fund within the World Bank dedicated to tackling health emergencies, Merkel announced at a press conference after the summit formally ended on Monday afternoon. Reacting to the summit’s final declaration, the European Climate Foundation described the G7 leaders’ announcement as historic, saying it signalled “the end of the fossil fuel age” and was an “important milestone on the road to a new climate deal in Paris”. Others called on negotiators seeking an international climate deal at Paris later this year to make total decarbonisation of the global economy the official goal. “A clear long-term decarbonisation objective in the Paris agreement, such as net zero greenhouse gas emissions well before the end of the century, will shift this towards low-carbon investment and avoid unmanageable climate risk,” said Nigel Topping, the chief executive of the We Mean Business coalition. Merkel won praise for succeeding in her ambition to ensure climate was not squeezed off the agenda by other pressing issues. Some environmental groups said she had established herself as a “climate hero”. Observers said she had succeeded where sceptics thought she would not, in winning over Canada and Japan, the most reluctant G7 partners ahead of negotiations, to sign up to her targets on climate, health and poverty. The One campaigning and advocacy organisation called the leaders’ pledge to end extreme poverty a “historic ambition”. Adrian Lovett, its Europe executive director, said: “These G7 leaders have signed up ... to be part of the generation that ends extreme poverty and hunger by 2030.” But he warned: “Schloss Elmau’s legacy must be more than a castle in the air. But the Christian relief organisation World Vision accused the leaders of failing to deliver on their ambitious agenda, arguing they had been too distracted by immediate crises, such as Russia and Greece. “Despite addressing issues like hunger and immunisation, it was nowhere as near as ambitious as we would have hoped for,” a spokeswoman said. Jeremy Farrar of the Wellcome Trust said the proposals would “transform the resilience of global health systems”. But he said the success of the measures would depend on the effectiveness with which they could be coordinated on a global scale and that required fundamental reform of the World Health Organisation, something the leaders stopped short of deciding on. “We urge world leaders to consider establishing an independent body within the WHO with the authority and responsibility to deliver this,” he said. Merkel, who called the talks “very work-intensive and productive” and defended the format of a summit that cost an estimated €300m (£220m), said that the participants had agreed to sharpen existing sanctions against Russia if the crisis in Ukraine were to escalate. She also said “there isn’t much time left” to find a solution to the Greek global debt crisis but that participants were unanimous in wanting Greece to stay in the eurozone. Demonstrators, about 3,000 of whom had packed a protest camp in the nearby village of Garmisch Partenkirchen, cancelled the final action that had been planned to coincide with the close of the summit. Only two demonstrators were arrested, police said, one for throwing a soup dish, another for carrying a spear.